A good swim with dolphins in Xcaret can be experienced in different ways. You can do it peacefully, or by adding a little - or a lot of - adrenaline. 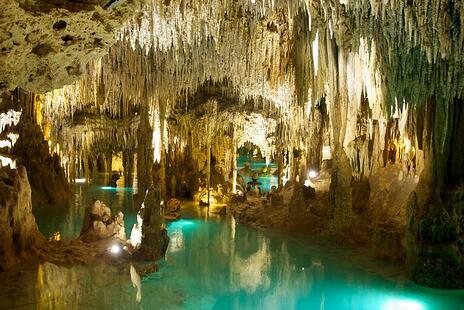 If you are the type of person that longs for extraordinary experiences, Xplor and Xenses are the right options. But you can’t visit both parks, can you? Which one will leave you with the best memory to share with your friends when you get back home? On the one hand, we have Xplor which needs no more explanation than that it’s built on a surface that once - 65 million years ago - was struck by an asteroid. Point for Xplor. This park, as its name indicates, is made for all of those who have an explorer’s soul and can perform activities both on the surface and underground. For the true Indiana Jones there is Xplor Fire, a more extreme option for those who want to fly on higher ziplines, go for a ride in an amphibious vehicles and discover ancient landscapes at night and surrounded by fireflies. 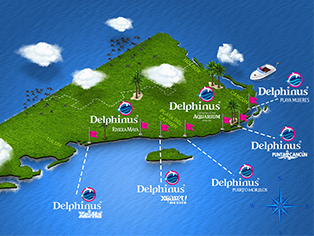 Free transportation from the hotel to Delphinus Riviera Maya Xplor and back. All-inclusive access to the park (runs 2 circuits of 7 zip lines, swim in underground rivers, drive amphibious vehicles in the jungle, explore caves with stalactites and stalagmites, enjoy unlimited food and drinks). On the other hand, if you thought going to a 4DX movie theater was the ultimate sensory experience, Xenses will pleasantly surprise you, since all its attractions are made to test your senses. Mirror labyrinths, lights and music in sync, places that will defy gravity and even the opportunity to fly is what you will find in this magical park. Xenses is a park that, like Xplor, causes a release of adrenaline but in a different way, it is similar to a fantasy movie in which you will not only explore the different scenarios, but also your own insight. Point for this place! Transportation hotel - Delphinus Riviera Maya - Xenses Park. Now you know! Although they are different, both parks are part of complementary experiences and, if we were you, we would go to both because entering the arena and getting dirty in the mud at Xplor sounds amazing, as does the incredible sensory, introspective and magical experience at Xenses. In the end, the goal is that the next time you swim with dolphins in Cancun, it becomes the best adventure of your life. Book now!